(TriceEdneyWire.com/GIN) - "We urge you: spare and release these women,” begged Patricia Danzi, director of the International Committee of the Red Cross in Africa. .. “Like all those abducted, they are not part of any fight." "They are daughters and sisters, one is a mother -- women with their futures ahead of them, children to raise, and families to return to." 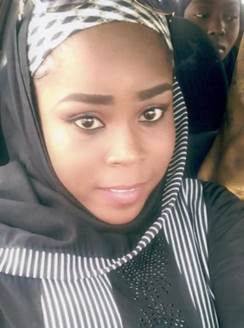 Nonetheless, the Islamic State West Africa Province (ISWAP), a self-declared caliphate of Boko Haram, rejected their entreaties and executed 24 year old Hauwa Liman, an aide worker. The insurgents further vowed to make another captive, schoolgirl Leah Sharibu, a slave for life. In a video seen by some journalists, Hauwa was forced to kneel down, with her hands tied inside a white hijab, and was then shot at a close range. A midwife with ICRC, Saifura Ahmed, who had been abducted at the same time, was executed by Boko Haram in September. ISWAP said the two women were killed because they were Murtads (apostates) by the group because they were once Muslims that abandoned their Islam when they chose to work with the Red Cross. The 24-year-old nurse and student of Health Education at the University of Maiduguri was among the three aid workers abducted in an attack on a heavily-guarded military facility in the small town of Rann, Borno State on March 1, 2018. The insurgents also abducted Alice Loksha Ngaddah, a nurse and mother of two, and Saifura Husseini Ahmed, a midwife. Four soldiers and four policemen were also killed. “From today, Sharibu and Ngaddah are now our slaves," it said. “Based on our doctrines, it is now lawful for us to do whatever we want to do with them." Regrets from Nigerian Information Minister Lai Mohammed did not persuade some Nigerian citizens that the government had done all it could possibly do to free the women. Meanwhile, a new entry into the political race for the presidency is Obiageli Ezekwesili. In 2014, Ms Ezekwesili, a graduate of Harvard and a founding director of Transparency International, captured the world’s attention with #BringBackOurGirls, a campaign to rescue 276 schoolgirls who had been kidnapped in Chibok, Nigeria. In announcing a presidential bid on Oct. 7, the former World Bank official now hopes to upend establishment politics in Africa’s most populous country.